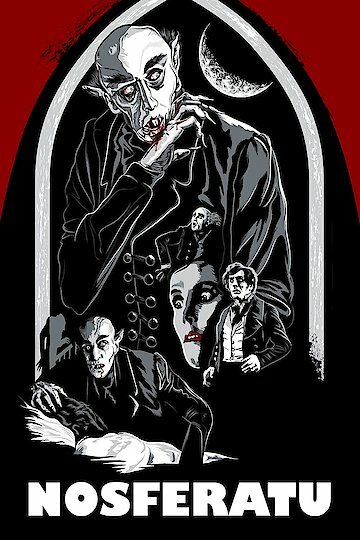 Also known as A Symphony of Horror this silent film by F. W. Murnau was originally meant to be a straight adaptation of Bram Stoker's Dracula. However,unable to gain permission, the characters and settings are changed but the story remains fairly true to the novel. Thomas Hutter is sent from Germany to Transylvania in order to finalize a lease with Count Orlok. Encountering superstitious locals he ignores their stories of death at the castle and continues his journey. Discovering the horrible truth he escapes the castle however Orlok is already on his way to Germany and Hutter's young wife. Nosferatu is currently available to watch free on The Roku Channel, Viki and stream, download, buy on demand at Amazon Prime, FlixFling, Fandor, FlixFling VOD, Amazon, Vudu, Google Play, iTunes, YouTube VOD online.